To make smaller individual galettes, divide the dough into howevermany pieces you'd like to make, and roll each piece into a circle. You won't need as long a baking time. 1In a bowl or the bowl of a food processor, stir together the flour and salt; add the butter and blend with a fork or pastry cutter (or pulse with the food processor) until the mixture is crumbly, with pieces no bigger than a pea. (You don't want the butter to be completely blended; some should be, with some pieces left bigger.) Add the ice water and stir just until the dough comes together, adding a little more of the dough is dry. Gather into a ball, flatten into a disk, wrap in plastic and refrigerate for an hour or overnight. 2Preheat oven to 375°F. On a lightly floured surface, roll the dough out to about a 14" circle (it doesn't need to be perfect) and slide it onto a baking sheet. 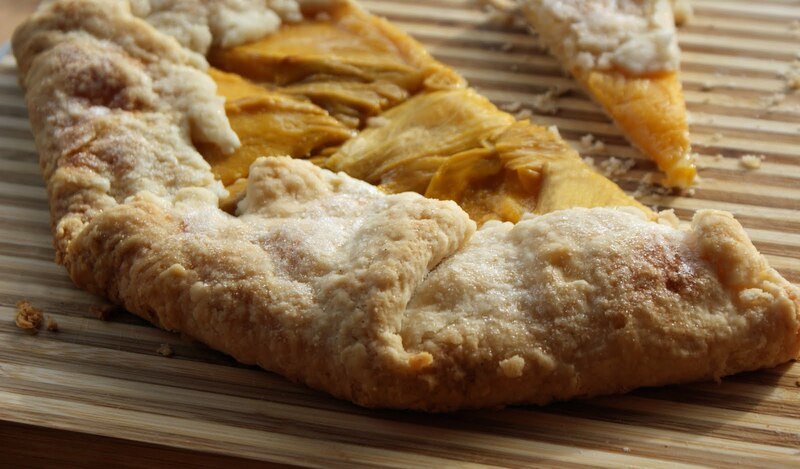 Place the mango in concentric circles on the dough, leaving a 1"-2" border around the edge. Sprinkle the fruit with sugar (to taste - depending on how sweet your mangoes are) and fold the edges of the crust over the fruit, letting it fold wherever it wants to. If you like, brush the crust with a little beaten egg and sprinkle with more sugar - coarse, if you have it. 3Bake for about 45 minutes, until golden. Let stand at least 10 minutes before serving; cut into wedges and serve warm or at room temperature.